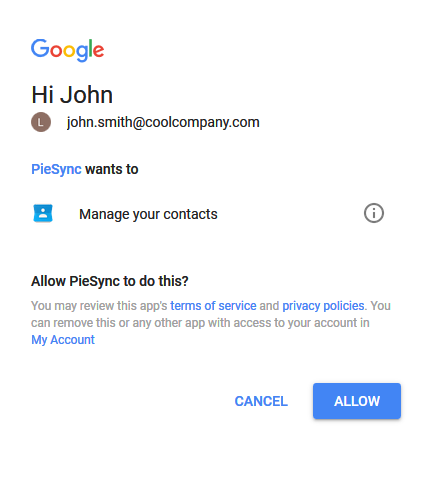 This step-by-step guide will show you how to configure a sync task on PieSync that will be synchronizing your databases between Woodpecker and Google Contacts. Select Woodpecker, and then Google Contacts from the app list in PieSync. Type in part of the name in search until you see the app in the list. Back in PieSync, click the blue authorize button below Woodpecker, and paste its API key into the dialog box, then click "Next". In PieSync, click the blue authorize button below Google Contacts. Use the pop-up window to log into your account. Click "Allow" to grant access. When that's done, click "Configure the sync between Google Contacts and Woodpecker". Remember that the extra filters and actions are optional, and should correspond to your specific needs (if any) for syncing data. For example, select in Group and Coworkers to only sync prospects in the group "Coworkers" in Google Contacts. 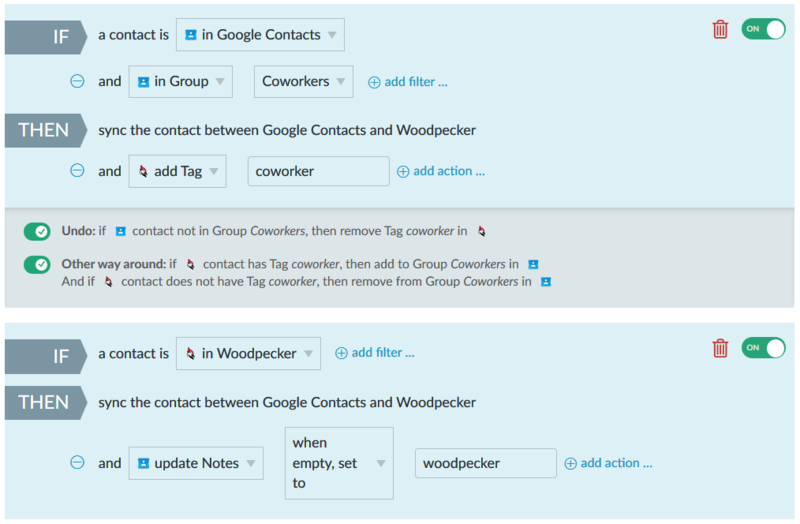 For example, add Tag, and type in the tag that should be added (like "coworker") for the newly synced prospects in Woodpecker. Next, you can add similar filters and actions for syncing from Woodpecker to Pipedrive right below. For example, if the phone number for a contact in Google Contacts is 12345, but it's 13335 for the same contact in Woodpecker, one "version" will have to overwrite the other. You need to decide which app will "know best" and have the correct data, when such differeces are detected. Note that you can also select additional options here, such as tagging deleted contact from Google Contacts with "piesync_trash" in Woodpecker. If Google Contacts “wins”, it will overwrite conflicting data in Woodpecker. Surprise: the default field mappings are already configured by PieSync. For example, Phones (in Pipedrive) is mapped to Phone (in Woodpecker). Click "Start syncing now!" to finalize the setup and start the sync task.